Here in my little corner of Canada, summer is long-longed for and fleeting. We want our kids to really experience it, to relish every day, to explore and play and learn and savour the long days and warm buggy nights. Here are just a few ways to dive in and make summer a magical time for the whole family. 2. Make s'mores around a campfire. For even simpler s'mores, use petit ecolier cookies in place of graham crackers and chocolate! 3. Pack small baskets full of grapes and crackers and slices of cheese and have a picnic lunch in the yard. 4. Fill the kiddie pool with water and dish soap and try making giant bubbles with a hula hoop! 5. Learn about the thunder. Read books about thunder to the kids and watch youtube videos so that when a summer storm hits it will be more fascinating than frightening. 7. Let the kids stay up late to curl up in sleeping bags in the backyard and talk. 8. Give them a fly swatter and pay them a quarter for every fly they kill in the house. 9. Buy a tie dye kit and dye something! 11. Make cucumber mango salsa. 12. Eat a lot of watermelon. 13. Practice cartwheels on the lawn. 14. Go for Friday evening drives to the ice cream shop or park. Drive with the windows down. 15. Go for Saturday morning walks through the farmer's market. 16. Make homemade "ice cream". 18. Keep a basket or tote full of basic picnic supplies (blanket, dishes, utensils) so you are always ready for a picnic on the go. 20. Make sun tea with the kids. 21. Build a makeshift splash pad with a hose and household items like a tarp, pool noodles and buckets. 25. Encourage water balloon fights! Thanks for visiting the Complete Guide to Imperfect Homemaking. 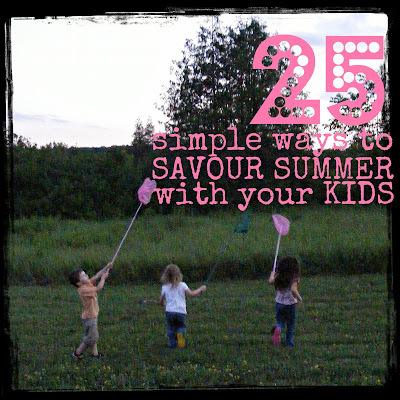 Why not leave a comment below and tell me: what is your favourite way to savour summer? When our kids were young we would have family water fights on a hot summer day! I'm always excited tO find another Canadian MOmma, where in Canada are you? We love to take our kids fishing! We head outside to play first thing in the morning, when the air is still fresh and cool and we are full of energy. We spend the afternoons inside chilling in the A/C reading books and napping. Rosie (my 11 year old) and I will sometimes sleep on the deck, if it's not too humid outside. We also like to go to the free outdoor concerts held on a big plaza not too far from here. There's always plenty of soft grass and shade and little kids running around. I LOVE this. I just want to do ALL of these things myself. I am going to reference this as a summer list for myself. Thank you for the list...it is amazing! I've been reading you for a while now and i love your blog. I feel as if you hold no judgement. We make a list every summer of what we want to do, this year it hit 142 things, and lots on this list you wrote :) Summer is all about family and love and fun. With my kid always in school I soak up as much family time as I can. We have camp outs in the living room (texas weather is hot) or picnic dinners late at night on the trampoline ..
Kelly, your blog is great. I love homemaking too, and I love the support you offer. My kids are now adults, but I still love creating a home for my husband and parents, who I help care for. I believe there is a wonderful, overlooked role in creating an organized, loving home for the family, whatever size that family. Thanks for all the great tips! Your blog arrives in my email, so I don't miss anything. :-) Your kids are darling! I love your lists and this one is as good as ever! So glad that you blog this stuff it's truly an encouragement to motherhood and spurs me on. You never make me feel "down on myself" but u make me say "yeah we can do that it's gonna be great!" Your list also conjures up memories of summer, as I live in New Zealand so we are smack in the middle of winter (july being like January here) thankfully its pretty mild climate but still there is a freezing fog nipping at the window and we're inside doing puzzles and felt boards and baking and eating too many cookies! Anyway, you're awesome Kelly - keep sharing you with us on your blog! I absolutely love how frugal you are. Outside of food none of the above activities cost money. My mother raised all 9 of her kids on the cheap and I have great memories of my childhood. You have an instant follower. Keep blogging you crazy canadian! I love #13. I keep my picnic basket stocked with those items as well as a garbage bag and disposable bibs. When we return I just empty the garbage and refill with new supplies. Hi Kelly, I wandered over your direction today via Pinterest. In fact I have pinned most of your blog now to my Pinterest board, probably violating some sort of Pinterest Ethics thingy. I love what I see here; and I love who you appear to be. I love your candor, your humor, your authentic Christianity, and your energy. Oh, and I love your good ideas too. So nice to meet you. I'll be back! Love your blog :) I'm a new mom and am loving your great ideas! Hi Kelly, I just love your blog. I'm also Canadian (In Ontario) where are you??? I read your list and yes it so reminds me of my own childhood I will be adding your ideas to my family summer list, my preteen (12) & teenager (15) are becoming bored so it's time to hit so those family root activities. Please keep sharing your ideas! Great post, you made me smile!! All great and easy ideas!